1: Start with clean hair –this seems very obvious but it might be tempting to move from one style to the next without having a clean palette to work with. If you apply heat to hair that already has product and dirt in it the only thing the heat will do is bake the residue into the hair leaving it looking dull and lifeless. 2: Deep condition your hair- Hair that is thoroughly conditioned means a balance of both moisture and protein. Moisture and proteins gives the hair the armor it needs to withstand the high temperatures you are about to subject your strands to. Either condition your hair overnight or do some kind of heat conditioning prior to your flat iron session. There is no one product that is dedicated to conditioning, use what is practical for you just ensure that you have a balance of protein and moisture. 3: Stretch your hair if you are natural – one of the easiest ways to heat style your hair is to have it in a state that is dry and stretched. This might mean washing, conditioning and allowing the hair to dry in braids or twists overnight. The braids will keep the hair detangled and stretched. If the hair isn’t dry, use a blow dryer to finish the job, you won’t need to use the blow dryer for very long since you already prepped the hair the night before. 5: Clean your flat iron – this is almost as important as cleaning your hair, flat irons tend to collect gunky stuff over time and this should be removed in a safe manor prior to using it. Use a damp warm cloth to clean the plates and allow the iron to fully dry. 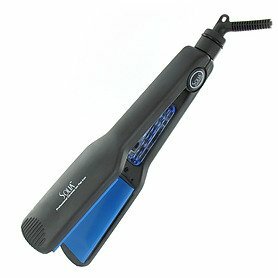 You can heat the iron a little before cleaning however never clean the iron when it is plugged in4: Do use smoothing balm or serum that act as anti humectants to keep the hair from frizzing up too quickly. Don’t use a heavy oil prior to flat ironing that only keeps the hair looking flat, weighed down and lifeless. This is not set in stone however, some women like the flat look so do your research to figure out what is best for you. 6: Dedicate some time to the process – Flat ironing can take some time depending on the length and thickness of your hair. Don’t hesitate to use small sections of hair and to take your time with the process to avoid ripping through your hair. Nobody wants heat damage so making sure you are not in a rush is very important. 7: Choose the best heat protectant for you – This may involve a bit of research because there are so many options on the market. Take the time to spray the hair thoroughly to ensure that your hair is protected from high temperatures.